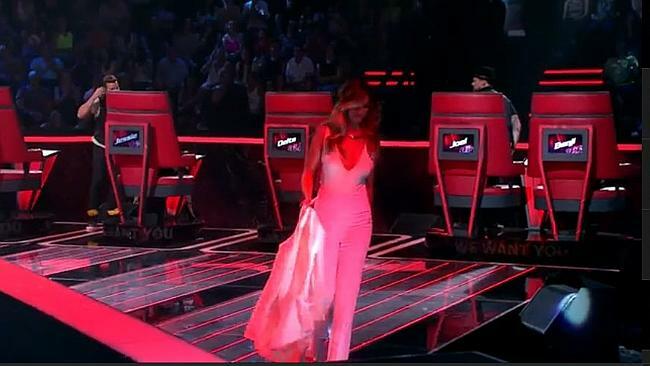 Goodrem has a verbal fight with fellow coach Jessie J and storms off the set of the The Voice, Australia, after a performance of Marilyn’s Monroe’s Diamonds Are A Girl’s Best Friend by O’Callaghan. Goodrem says O’Callaghan’s performance has a good vibe, despite it not turning any seats. Jessie disagrees and continues to critique her. Goodrem takes off her microphone and earpiece, swears and leaves the set. I’m over this s**t. I’m out. I can’t sit there and watch artists be embarrassed on stage. I think I had, had enough of the tough love. I want to be someone who wants to encourage people’s dreams. Jessie J says she knows Goodrem was “genuinely angry” with her but she wasn’t going to change her tune.